Chef Gloria B is offering a new consultation service to help with the side effects of nausea, medication, radiation, mouth sores, and chemo therapy. Included will be a three hour consultation (divided into three or four weekly sessions as needed by client), 8 recipes designed for your particular condition and food preferences. Contact Chef Gloria B for more information. 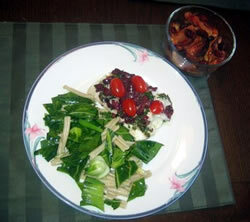 Chef Gloria B prepares mouthwatering home cooked meals chock full of immune boosting ingredients. perfect for those going through treatment and cancer survivors. Chef Gloria B will create a meal plan and cook healthy cancer fighting foods for a cancer patient who has special dietary needs. She addresses the weight loss and side effects commonly caused by cancer treatments, and creates healthy recipes that address the special nutritional requirements of cancer patients undergoing chemotherapy and/or radiation. Because of her experience cooking for cancer patients, Chef Gloria B has first hand knowledge of how foods must be prepared in order to adapt to the ever changing body and taste buds indicative of a person undergoing treatment for cancer. Using the right kinds of foods such as fiber-rich fruits, vegetables, grains, and legumes can make a difference in the way the body fights the disease. Chef Gloria B is able to create healthy menus rich in these cancer fighting foods, unique to each person’s situation and make changes as deemed necessary over the course of treatment. Please don’t hesitate to call or email if you or someone you love is suffering from cancer. There are foods and nutritional options that can help. Chef Gloria B was interviewed by the American Personal & Private Chef Association.